A few days ago a paper I co-authored came out in Molecular Ecology Resources. That paper is of relevance to this blog because it releases over 20,000 DNA sequences (gene CO1) from over 2,000 species and 50 genera of Microgastrinae braconid wasps, collected in over 75 countries. The number of sequences made available for free use of the scientific community and the general public it is likely one of the highest ever released. It speaks volumes of the efforts made by the International Barcode of Life or iBOL (among many other institutions, partnerships and initiatives) that are promoting the use of DNA barcoding to help cataloging, studying and describing the amazing diversity of life in this planet. [For those interested in more information about DNA barcoding, there are many resources online to look at, probably an easy way is to just start browsing the iBOL website and related sites mentioned there. Suffice to say that DNA barcoding has many practical applications, but for this post I will only focus on its potential for taxonomists working with parasitoid wasps]. The sequences we are talking about today were amassed during the last eight years and they represent the effort of many scientists and institutions -that explains the long chain of authors being part of the paper. 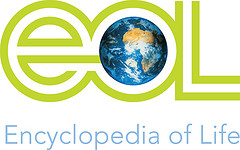 The resources can be accessed using BOLD (The Barcode of Life Data Systems) a magnificent online resource designed to support the generation and application of DNA barcode data. 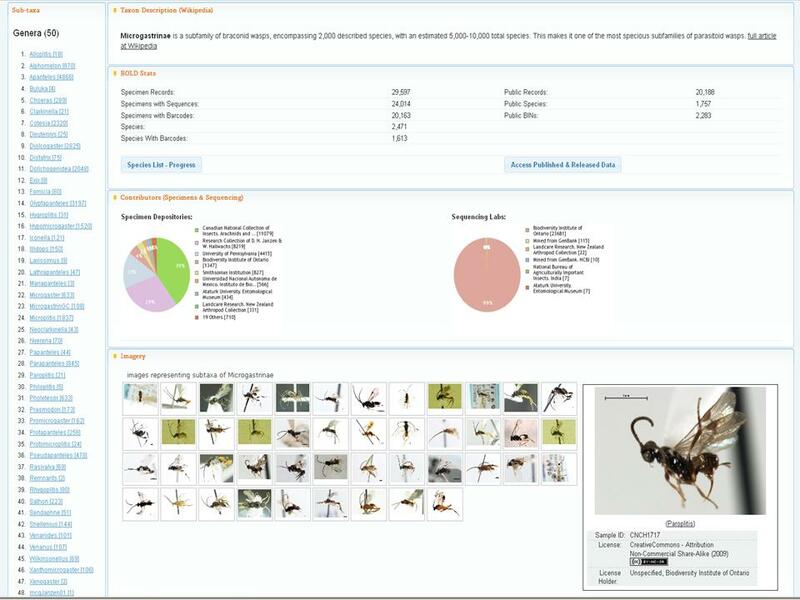 A view of the BOLD website with summarized information about microgastrinae wasps. Accessed on December 21, 2012. For a larger view and more information on the group click here. Back to the paper mentioned, it not only releases a significant amount of data, but it also provides suggestions on how to use it in the near future. For example, we considered the sequences to be important in efforts related to: 1) Discovery of cryptic species and description of new taxa; 2) Estimating species numbers in biodiversity inventories; 3) Clarification of generic boundaries within Microgastrinae; 4) Biological control programmes; 5) Molecular studies of host-parasitoid biology and ecology; 6) Evaluation of shifts in species distribution and phenology; and (7) Fostering collaboration at national, regional and world levels. All of the above mentioned points are relevant to this blog -and are indeed relevant to biocontrol workers, biodiversity researchers, taxonomists, etc. What is more important: many specimens mentioned in the paper actually come from Canada (~6,000 specimens), or from related areas in the Nearctic or Palearctic regions (+3,000). And that will allow us to advance researches in a way that would not have been possible in the past, before the arrival of DNA barcoding. Just one example: I am now working with several colleagues of the provinces of Alberta and Ontario (Canada) and the Scotland Museums in Edinburgh (UK) to prepare two papers recording new species for Canada that previously were only know from Europe. Those species are of relevance to efforts in the biological control of important pests, but could only been discovered in the country thanks to the relatively large barcoding database that we now have available. And there are many more species in the same situation, waiting to (hopefully!) be studied in future researches. We just do not have the time now to do it because Canada lacks a full-time researcher working with Braconidae. But the molecular data and the specimens are here, in the national collection in Ottawa, waiting for better days when we can realize the full potential of what we have already gathered. DNA barcoding opens many doors to taxonomists working with hyper-diverse groups (i.e. groups with thousands of species, such as Braconidae). Those groups quite often happen to have lots of cryptic species (i.e. species that look extremely similar in external morphology and thus are very difficult to tell apart from each other). But DNA barcoding provides a first, fast, and relatively cheap way to sorting the specimens, allowing the taxonomist to focus on the potential species delineated by barcodes and advance the research further. I have been lucky to have the opportunity of using barcoding for 7 years now. And I am convinced that its combination with traditional taxonomy (i.e. morphology studies, biological, ecological and geographical information of species, etc.) is the way to go with Microgastrines and similarly difficult groups. I hope that some day -hopefully sooner than later- it becomes a common tool for taxonomists and biocontrol workers everywhere. We are blessed in Canada because of the amount of data we already have available. Let's just hope we can support more the researchers and the researches that aim to deliver in those fronts!